While hunting dolphins is technically illegal in Peru, Austermühle calls it an “open secret” in the fishing industry, with little to no enforcement. The practice was outlawed in 1996, but it is rarely enforced, he said. At its peak, nearly 20,000 dolphins were being killed in Peru each year, Mundo Azul estimates. Despite the threat of incarceration or seizure of their fishing licenses, fishermen continue to catch dolphins. 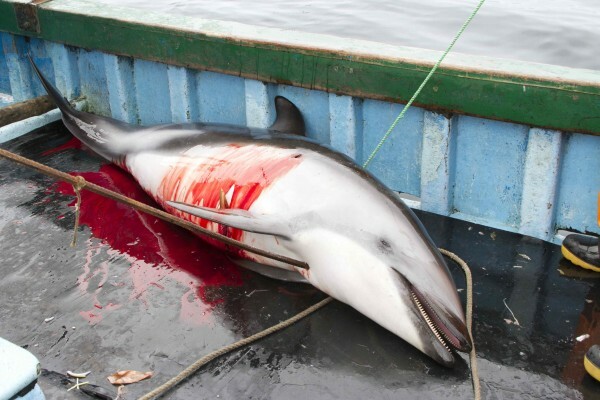 In other countries, where there are no specific laws to protect small cetaceans, including dolphins and porpoises, the killing is left entirely unchecked. Perhaps the most well known occurrence of dolphin killing is in Taiji, Japan, the city made infamous by the 2010 Oscar-winning documentary The Cove. In Taiji, dolphins are gathered and killed—not for shark bait, but for human consumption and for selling to marine parks. Peru is not alone in their use of dolphins as chum. Fishermen in Indonesia, Vietnam, and Tanzania have also been known to lure sharks with dolphin meat, claims Hardy Jones, the executive director for Blue Voice. The Peruvian government vows to investigate the crimes and plans to deliver a report by June 2014, according to the Los Angeles Times. Until then, what can you do to help? Stay informed. You can help spread the word, become a dolphin conservation volunteer, or sign Blue Voice’s petition to the Peruvian government to stop the slaughter.